A clean and tidy workspace promotes efficiency and productivity. Having all the necessary tools and work materials you require for your current task right in front of you will limit the amount of time you spend looking for them, and allow you to work on your task with undivided focus. Clear off your desk or workspace so you have only one task in front of you. 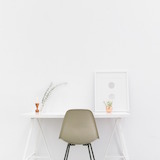 Place everything irrelevant to your current task elsewhere, either on the floor or on a table behind you. Then, gather all the information and work materials you need to complete your task, and have them at hand. Do this prior to beginning a new task. You’ll likely be sitting for long hours at your desk, so it’s important to have a comfortable chair that provides ample back support and allows your feet to rest flat on the floor.